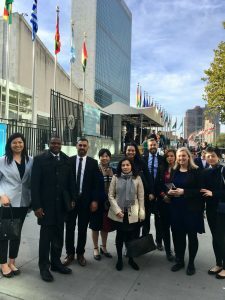 In 2018, we launched a new program of small group Study Tours to UN Headquarters. The two tours run in 2018 are described below. During both tours, our ten participants toured UN headquarters and were able to access sessions of the Security Council (in New York) and the Human Rights Council (in Geneva) not open to other visitors. Our groups met with UN officials and representatives of such agencies as UNICEF, the World Trade Organisation and World Health Organisation and organisations which link into the UN such as the International Peace Institute and the Association for the Prevention of Torture. In 2019, we will visit Geneva from 2-8 June and New York from 20-26 October. Click here for the 2019 tour brochure. The cost of each tour is $5950 per person – information about what this covers and does not cover and how to book your place is included in the tour brochure. “The UNAAV Study Tour to New York proved to be an invaluable and thoroughly enjoyable experience. We were provided with unique insight into the priorities, plans and projects of the UN and its agencies, and given the opportunity to make connections and learn from people working within the organisation, including many Australians. Developing a deeper understanding of the vision and values of the UN and its agencies has equipped us to become greater advocates for the work of the UN in the Australian context” – Dani Pallister, 2018 NYC Tour participant. 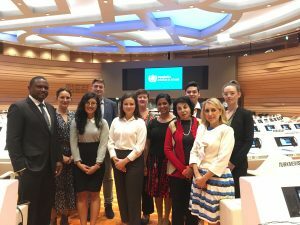 Our inaugural study tour to Geneva was a huge success with participants taking part in a week of meetings with UN staff and ambassadors; UN agencies and NGOs. Participant Alicia Mathews said the tour was a “life changing experience to see first-hand the workings of the United Nations and their role in supporting peace, wellbeing and human rights for all” and said she would “highly recommend the tour to anyone with an interest in the values of the United Nations and a strong interest in learning what you can do in to be a good global citizen of the world”. Please email office@unaavictoria.org.au if you would like to go on the mailing list for future tours.